Jedidiah's Jerky is a brand owned by Jedidiah's Jerky and Gourmet Snacks based out of Laughlin, NV. They've been around since 2005. The company was started by David Coffey, a veteran of the jerky marketing business going back to 1984 with Polley's Jerky. This is actually the brand's first turkey jerky, something they just came out with this month. I had acutally met Coffey in person last October and he told me about a turkey jerky that he was getting ready to launch. I had already reviewed several of his beef jerky varieties, some of which I've awarded best ratings to, and so I've been eagerly awaiting this new turkey. Looking at the packaging, the meat consistency, and they way the pieces are sliced, it appears this turkey is an extension of Jedidiah's "Private Reserve" line, though it doesn't include those words on the labeling. But unlike their Private Reserve jerky which is sold in 3.65 ounce bags, this turkey weighs in at 3.2 ounces but costs you a couple bucks more. I'm assuming therefore, this stuff is really killer jerky. Turkey breast meat, soy sauce, brown sugar, lemon juice, garlic powder, pepper, worcestershire sauce. The tastes I pick up from the surface of these pieces is a good deal of sweet, a salty taste, the soy sauce flavor, and a slightly fishy flavor probably from the worcestershire. In the chewing, the saltiness increases, and I can taste the black pepper, and I also get a garlic flavor in the back of my mouth, and finally a bit of the natural meat flavors. My initial impression is that there's a lot of flavor intensity with this jerky. Each piece I put into my mouth explodes with flavor, right from the surface taste to the final swallow. And I can't help noticing the flavor complexity. The salty and sweet flavors are easily apparent, but I can also taste the soy sauce, the garlic, the black pepper, some natural meat flavors, and the faint bit of anchovies from the worcestershire sauce. The sweet and salty flavors however are still dominant in this jerky. It's a toss up between which one dominates this jerky overall, so I'll just combine the two and say it's both. The salt intensity is perhaps on the strong side, and after eating through the bag I find myself needing a drink to relieve a mild salt scorching. This might actually taste saltier if not countered by the heavy sweet flavor. The second most dominant taste is probably the soy sauce. There's enough of it there to taste off the surface, and in the chewing it makes itself known more clearly. The third strongest flavor is another combination, this time of the natural turkey meat flavors and the black pepper. They both seem to sit behind the sweet, salty, and soy sauce flavors at equal strength. Some pieces tend to provide a stronger turkey meat flavor, while a few others have a weaker flavor. The same with the black pepper, with some pieces having more visible bits than the others. Overall, I find the flavor of this jerky to be quite delicious. 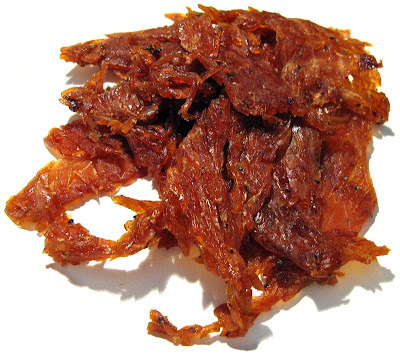 It's a moist jerky, being very easy to tear apart, and easy to chew. Considering the package is labeled, "Made with turkey breast", the chewing texture doesn't feel anything like turkey breast. While there is a fibrous feeling in the chew, it seems to chew more similarly to a "Fruit Roll-up", being rather sticky and somewhat gummy. Once I chew it up well, and get a lot of the sticky sugar out of there, it starts to feel more like meat, but maybe more like turkey leg meat than breast meat. In terms of clean eating, I don't get any fragments falling on my lap, but these pieces have some stickiness on the surface that remains on my fingertips, and requires some licking. Also, reaching into the bag for each piece will leave some stickiness across my hand. I didn't find any sizeable amounts of fat, and no chewy connective tissue in sight. Jedidiah's Jerky sells this turkey variety from its website at a price of $9.99 for a 3.2 ounce bag. That works out to a price of $3.12 per ounce making this a very expensive jerky. For general jerky snacking purposes, it's a decent value. If it was priced lower, it becomes a better value. Otherwise I found it very snackable with a lot of flavor intensity, and flavor complexity. And then considering how easy it is to tear apart and chew, I can go through this bag very quickly. The chewing texture may not be all that meat-like, but I found the flavor of this jerky to be very enjoyable. As a turkey jerky, it's a poor value. While I did get some natural meat flavors, it's just not enough to justify this high of a price. The fact that the chewing texture doesn't really feel like turkey kinda adds to that as well. If you want to enjoy turkey jerky for its unique flavor and texture, you'll get very little bang for your buck here. 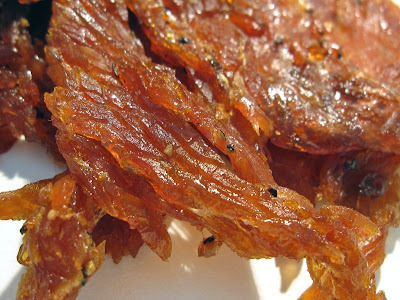 You might argue that turkey jerky is more healthy than beef, and that you could tolerate the higher price because of that. But if what you want is a healthy jerky, you won't find it here with the 820mg of sodium and 12g of carbs per 1oz serving. And I'm awarding that rating based on the seasonings and marinade of this jerky. It's got a lot of flavor intensity, even on the surface as well, which lends itself to being enjoyed more slowly. And there's also a good flavor complexity with a lot of components to dissect and enjoy. Each piece I put into my mouth I tried to focus on one particular flavor only to find another flavor creep up to grab my attention. I personally found the overall flavor to be quite delicious. The fact that it's easy to tear and chew adds to the snackability. The negatives I found with this would include the saltiness being a tad too heavy for my preference, and the chewing texture not resembling much like turkey breast meat. But these things can be overlooked for a great taste and snackability. This jerky from Jedidiah's is probably only the second turkey jerky brand that has won a best rating on the basis of its seasonings. The other best rated turkey jerkies all won with a strong natural meat flavor. I think a good beer variety is a light tasting honey blonde ale.